Our lovely White Twist Bear with a festive twist and our take on the Sugar Plum Fairy. This kit contains White Twist 16" bear skin, super-soft stuffing, star charm, birth certificate, party invitation, deluxe carry bag and our Green Velvet Christmas Gown & Cap outfit. 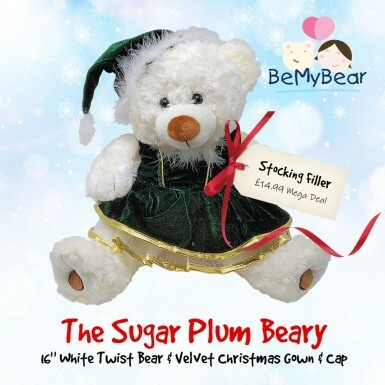 The Sugar Plum Beary is suitable for children aged three and over and is an ideal Christmas gift or stocking filler. 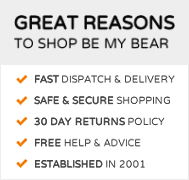 As with all of Be My Bear's teddy bear and stuffed animal making kits you will receive your White Twist skin with one-way zipper, a bag of soft and fluffy stuffing, our satin make-a-wish star charm to bring White Twist to life, a birth certificate, party invitations and instructions. To complete the package we also include a luxury gift bag so White Twist can be carried around in style and you'll also receive our Green Velvet Christmas Gown & Cap outfit.